Thinking about launching an SMS campaign for your business but not sure how to start collecting phone numbers? Don’t be discouraged, text marketing is definitely worth the effort. Did you know that 65 percent of businesses rate text as a “very effective” form of marketing? SMS has a lot of things going for it: very high response rates (45 percent as compared to 6 percent with email) and even higher open rates (98 percent as compared to only 20 percent with email). With this in mind, it’s no wonder you’re taking the step to include text in your marketing strategy. But before you take the dive and start sending offers to your entire phone list, proceed with caution. Some marketers aren’t fully aware of the laws of text marketing. And some businesses have paid very heavy fines to learn those laws. It may be tempting to buy a list of cell phone numbers and start sending them promotions without asking them first. Don’t do it. The Telephone Consumer Protection Act clearly states that doing so is a violation of customer privacy and punishable by law. While buying a cell phone list is not illegal, texting customers who haven’t opted into your marketing program is. Customers have to specifically give you permission to text them and that permission will not come with a bought list. If you send promotional texts to someone who hasn’t opted in, start preparing to face some hefty fines. A customer who has received unsolicited text messages from you can sue you for $500 – $1500 for every unwanted message. And the list of repercussions doesn’t end there. Instead of attracting new prospects, you get a group of angry people who will now associate your business with spam and lack of respect for their customers. Even if they could’ve been potentially interested in purchasing from you, now your number will most likely get blacklisted. The group of people in the bought list have no connection to your brand. It’s hard enough to encourage customers who have purchased and liked your products to sign up for a text marketing program. Imagine trying to convince someone who’s never had any contact with your business. 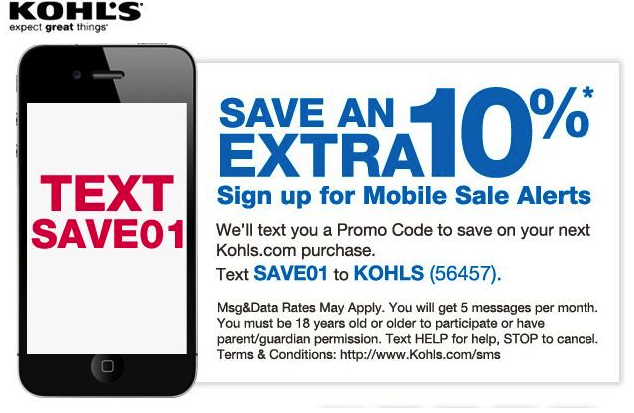 Avoid the whole scenario by only texting customers who have opted in. When Is a Customer Considered “Opted-In”? An “opted in” customer is someone who has specifically given consent for you to send them promotions. In the case of text, they do this by texting in a code your business has specified. Et voila! Now they’ve opted in and you can feel free to contact them without fear! Don’t be shy about texting your customers once they’ve said it’s ok. Did you know that 64 percent of customers say that they have a positive view of companies that use texting to contact them? And that only 30 percent of consumers receive texts from businesses even after they’ve given permission by opting in? So go ahead and send those messages. BUT, be careful not to bombard customers with too many messages. Just 1-2 messages a week is the right amount. Contests are an exciting way to increase opt-ins. Giving away free things or letting customers win something, whether big or small, can really help to amp up your list of subscribers. Just don’t fall into a common sweepstakes trap. Many businesses choose to give away an item such as an iPhone or a tablet because it’s something most people would want. But those people might sign up just to get the item and once the contest is over, you’re going to watch those opt-ins start to drop. Offer something that represents your brand well so you can be sure that the subscribers will stick around. 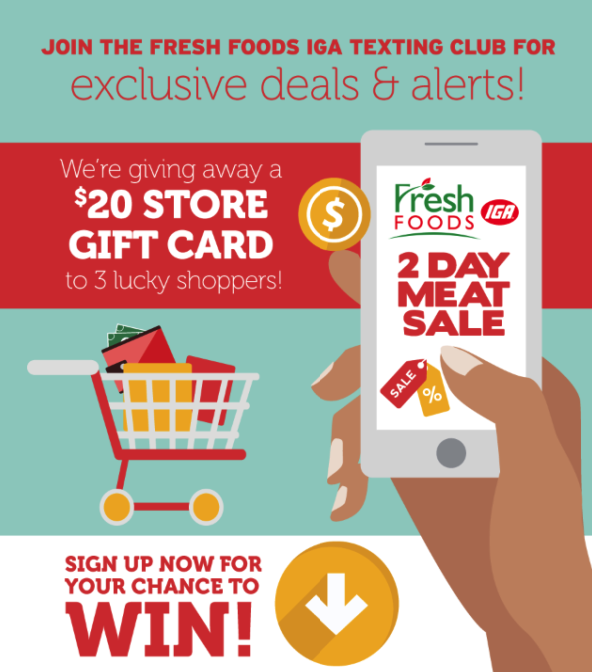 For example, the Fresh Foods grocery store offered a $20 gift card for participants who signed up for their text messaging club. This type of contest inspires participant brand loyalty and ensures that the new opt-ins are actually interested in your product and not just a fancy prize. For best results, advertise the contest across all channels: email, website, social media and in store. Email is one of the oldest digital marketing platforms. Because of that, you may have a very large list of customers who receive emails from your business. So, why not make it a 2-for-1? If a customer has already opted into your business email list, then you can send them an email letting them know about your promotional texts. Many customers today prefer text to email, with a full 66 percent preferring that businesses contact them through text over any other communication channel. Make sure that your promotions are different for each channel to avoid repetitive offers and subsequent opt-outs. Your social media should be different from your emails which should be different from your texts, etc. Chances are the majority of your traffic is on mobile. Take this opportunity to catch your visitors directly when they are on your website. 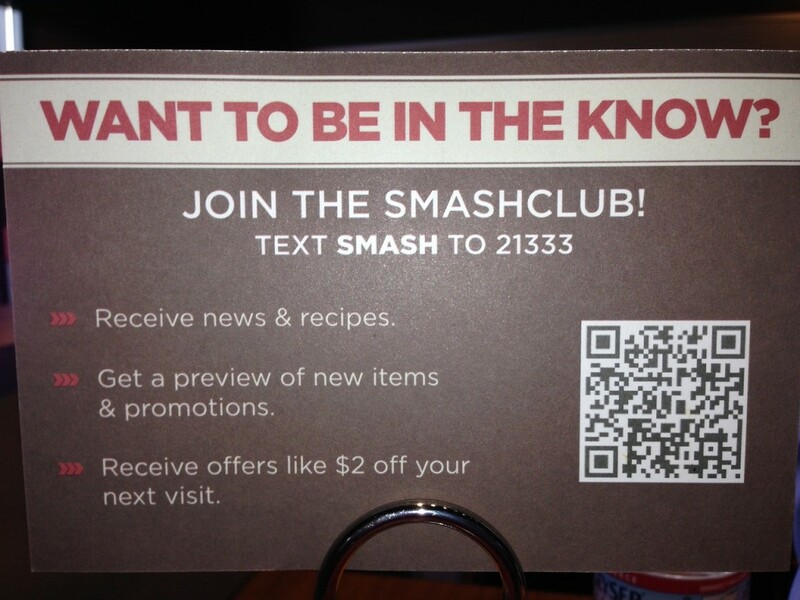 A simple mobile popup can help you invite them to join your marketing list. 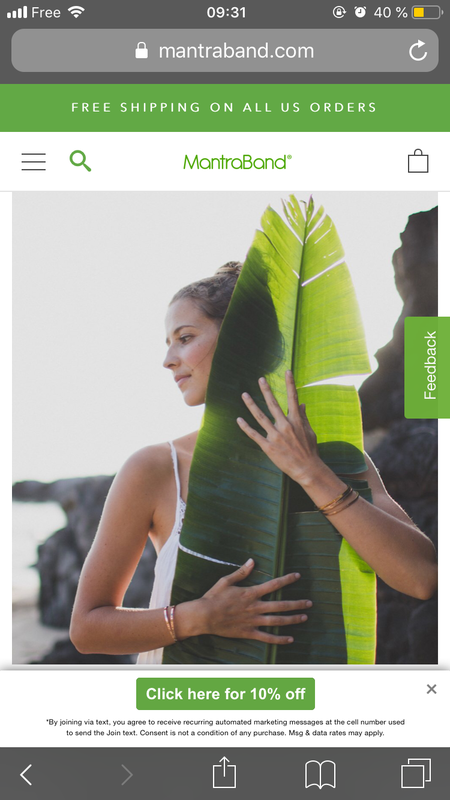 A mobile popup on MantraBand inviting mobile visitors to get 10% off when they opt-in to receive text messages from the brand. A message like “Text XYZ to 111111 to receive our weekly newsletter” is a pretty boring opt-in message. Try something that reveals the value of joining your text program. Like “Type ICECREAM to 111111 to try a new gourmet flavor every week this summer!”. A prompt that doesn’t let them know what they can expect and doesn’t inspire them isn’t likely to win many subscribers. Instead of creating a one-size-fits-all opt-in message, try personalizing it. Use the information you have about your customers to hone in on their preferences. Offer a discount on their favorite product for signing up. If a customer always buys a certain beauty product, entice them with a discount if they opt-in. Addressing customers by name also provides a personal touch. The more they feel you know what they want, the more willing they’ll be to get promotional texts from you. That means more subscribers. You must provide customers with opt-out instructions. These instructions must be clearly explained in the text itself. Unsubscribing is usually done by texting STOP to a specific number. If a customer opts out, you must stop texting them immediately. The pizza franchise Papa John’s faced a lawsuit in 2017 for spamming. The customer had opted in but claimed the franchise sent an endless stream of promotional texts. When the customer tried to opt-out, the company ignored his request. In Papa John’s case, the customer sought damages of $500 per unwanted text. This can result in heavy fines so be sure to pay attention to this important detail. To collect phone numbers for text marketing, smart businesses first learn the laws of text marketing. Remember not to send unsolicited messages to customers, even if they’ve subscribed to other marketing channels. Get them to opt-in first. After that, the sky’s the limit. Entice them with contests. Get them excited with intriguing texts. Send them personalized messages that make them feel VIP. Advertise your SMS program on other channels. And always make sure that customers have a way to opt-out. By using these techniques, you can enjoy a successful text marketing program. Good luck and happy texting!